M eanderthals has hiked the middle section of the Cataloochee Divide Trail several times, so we thought we should check out the northern end of the Divide. And I’m delighted we did. The forest is beautiful. Starting at Cove Creek Gap, high above Cataloochee Valley, the Divide trail follows the ridge for 4.5 miles past occasional views of the Smokies and Blue Ridge on either side. We happened to catch the mixed hardwood forest in the early stages of autumn coloring, enhancing the experience even that much more. 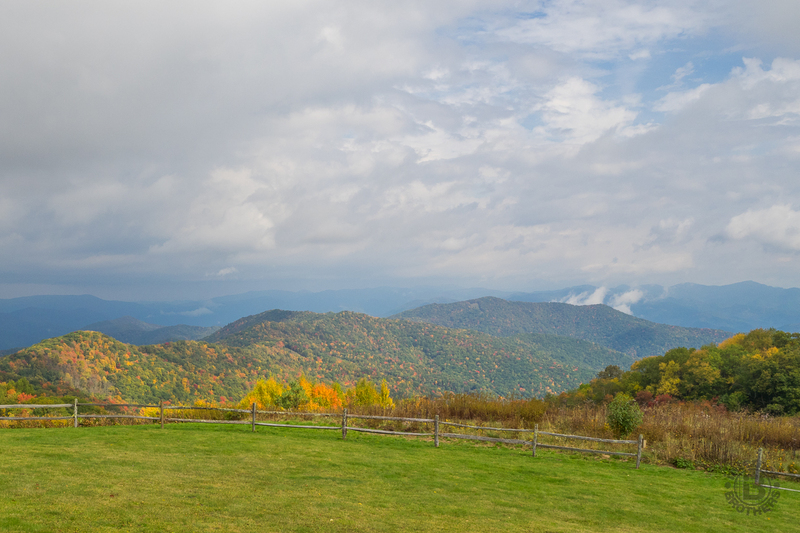 The destination is one of my favorite spots in all of Western North Carolina… Purchase Knob. Ken and I walked the Divide on Friday, October 9, 2015 from 8:30AM to about 2:00PM. Our plan was to take the Cataloochee Divide Trail from Cove Creek Gap to Purchase Knob, then return along the same path. Hike Rating: Moderate. Most of the elevation change is near Purchase Knob. Trail Condition: Excellent. Hardly any exposed rocks and roots. Some downed trees from recent storms. This is a very enjoyable trail. Starting Point: Cove Creek Gap on Cove Creek Road. Trail Traffic: No other hikers on the trail. School kids at Purchase Knob. How to Get There: From Asheville, NC take I-40 west to Exit 20, Hwy 276. Turn toward Maggie Valley, then take the first right onto Cove Creek Road. Stay on Cove Creek Rd. to the entrance to Great Smoky Mountains National Park at Cove Creek Gap. The last mile up on Cove Creek Rd. is gravel. There is parking for 4-5 cars. Trailhead is on the left. The Cataloochee Divide runs a little more than 12 miles from Cove Creek Gap at its northern end to Polls Gap on Heintooga Road at the southern end. We’ve done the middle section that follows the divide between Cataloochee Valley and Maggie Valley many times before, traversing from the Science Center at Purchase Knob to the magnificent overlook at Hemphill Bald. We also recently made a delightful loop hike below the divide that helped us explore the surrounding forest. Now it was time to get curious about what is on either end of this outstanding trail. When we arrived at Cove Creek Gap, we had the place all to ourselves, and it remained that way the entire day until we got to Purchase Knob. Except for the occasional jet overhead and just a wisp of breeze, it was totally silent too. Days like this enable you to hear the chipmunks chirping and the creaking trees rubbing together. I love the sounds and aromas of the forest. And what a splendid forest it is. Right from the start we could see the wide variety of deciduous hardwoods that fill the hillsides on either side of the divide — mighty oaks, hickory and buckeyes… the beautifully colored maples and locust… the birch leaves that were already laying on the ground. The trail is wonderful too. Those who take care of this one do a really fine job. It is smooth, nearly free of exposed roots and rocks, and very easy to negotiate. Really the only trouble we had with the trail was the thousands and thousands of fallen acorns that made it somewhat like walking on marbles. Particularly on the downhill stretches we had to be alert to rolling away. For the most part the trail follows the eastern boundary of the national park. Much of the length of the Cataloochee Divide is followed by this original locust fence that marks the national park’s eastern boundary. It was built by the Civilian Conservation Corps in the 1930s. Occasionally the trees will open up just enough on either side of the ridge to offer a glimpse into the valleys below. On this very overcast day, the Blue Ridge to the east was cast in grey with the ubiquitous valley fog swirling beneath. There is one cutout overlook on the west side that is a good eye test. If you peer real hard, you can see one of the meadows of Cataloochee Valley far below. We wondered if the elk and the tourists were getting along okay down there. There are also dirt and grass roads that come right up alongside the divide, usually to one of the trophy homes that sit high on a knoll. The first is Boyd Mountain Road, then followed later by Panther Springs Gap Road. My favorite was one not far from Purchase Knob known as Caeleum Sereum Ridge. I looked that up on a Latin translator and it came out to mean “The Sky.” Very appropriate. Some landmarks you may look for along the way include a series of massive rock fins that just seem to come out of nowhere. You can walk for miles and not see any rock, then come upon these very large outcrops that stand 10-12 feet tall. Another landmark is the man-made Taylor’s Turnaround(*). There is a quaint little shelter there that some also call the “Bus Stop.” Taylor’s Turnaround was built in the 1970’s, using both old and new lumber, as a rest area/hideaway by Dan and Deener (Diane) Matthews who are the proprietors/innkeepers at the nearby Swag Country Inn. It was designated as a sit-down turnaround that can lead hikers towards the inn. There is a fabulous view of Purchase Knob and beyond from the shelter. (*) Hat tip to Jann for research about Taylor’s Turnaround. Once you have passed the majority of features the trail begins to climb in earnest. This is the only really strenuous part of the hike, climbing about 500 feet over the final half mile to Purchase Knob. There are a few small switchbacks, but for the most part it is right up the fall line. After spending a few hours nearly every week this Spring and Summer volunteering at Purchase Knob, I immediately recognized the trees along the trail and the multi-colored flags in the ground that denote the various ongoing science projects. It felt like home. After 4.5 miles and about three hours, I was ready for lunch and some relaxation. The Science Center was teaming with hustle and bustle. There was a school activity bus from Buncombe County that brought several dozen youngsters for a day of fun and education with the park rangers. As I enjoyed my sandwich I was able to overhear their classroom discussion about soil sampling. Then off to the woods they went with buckets and augers. They looked excited. It tickles me to no end to see the kids able to get out into Nature like this, particularly the minorities that were part of the group. Hooray for national parks and the Science Center! Also, there was a group of adults inside the building who were receiving training of their own. October is a wonderful time for Purchase Knob. With cooler weather, the changing leaves and autumn wildflowers, and so much learning going on, it really lifts the spirit. The park rangers are to be commended for their commitment, and of course, their patience. This was my view from the porch of the Science Center as I enjoyed lunch. It was the only blue sky we saw all day. Renourished and rested, it was time for Ken and I to backtrack the way we came. It’s quite a bit easier going south to north as most of the way is downhill. There is a bit of roller-coastering along the length of the divide, but Cove Creek Gap is about 950 feet lower than Purchase Knob. We made significantly better time on the way back… mostly fewer photo stops I suppose. The forest was really colorful this day. You know that in between Autumn color that is part yellow and part green? We saw a lot of that. There was an occasional orange oak, and a few red hickory leaves, but mostly the forest was yellow; brilliant yellow. Perhaps my favorite month, this is what October means to me. There is the peacefulness, the serenity, the rainbow of color that marks the Fall. So too the sadness. It’s goodbye to the forest canopy for the next several months. It’s farewell to short pants and t-shirts. But it’s also hello to the hope and thanksgiving that we always have to look forward to. So let’s summarize. I thoroughly enjoyed this hike. In fact, I want to try it in other seasons. I suspect the Cataloochee Divide is littered with wildflowers in April, May and June. The winter, with its leafless forest, most likely offers extended views of the distant mountains and nearby valleys. Despite its nearly 10 mile length, this is not a difficult hike. Great exercise, but not a lot of panting and sweating. The destination of Purchase Knob at the end makes it quite rewarding. You will enjoy this one. If you’re looking for an even longer hike, as I mentioned above, the Cataloochee Divide Trail continues another 8 miles beyond Purchase Knob. There are other trails that come up from the western valley below that are options for exploration as well. I like the ability to take the divide in sections as a 4-5 hour day hike, and I look forward to trying the southern end at Heintooga Road. 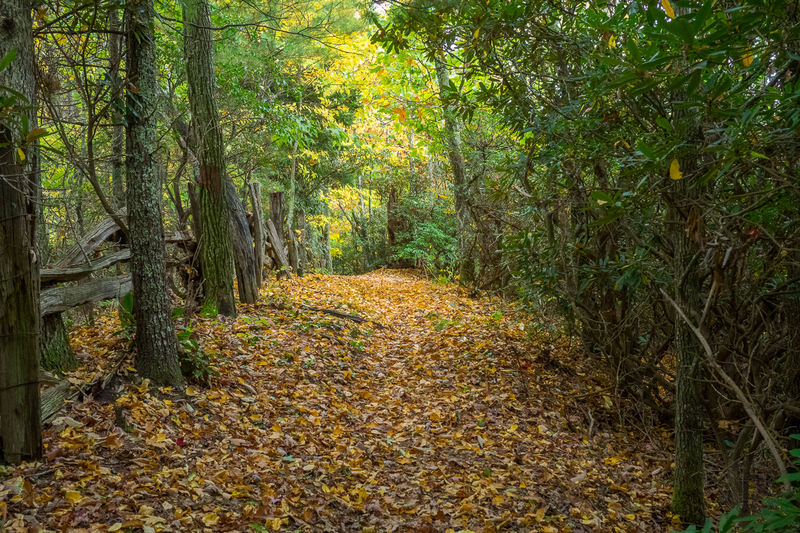 Updated August 30, 2016: I revisited a stretch of this trail from Purchase Knob to Taylor’s Turnaround and back to see what it looks like in summer. Some of the trail was a bit overgrown, but not too bad. Not as many wildflowers as Spring obviously, but multiple varieties of asters were out, as was the usual late summer fungus and mushrooms. I made a new friend on the trail. See if you can find him/her in the pictures below.